Imagine an ancient volcanic crater the size of Singapore, formed by an eruption so powerful the sun went hazy in China. Imagine it filled with the most pure, clean and clear water from mountain top and rain. This is one of New Zealand’s most sought-after holiday destinations, Lake Taupo. 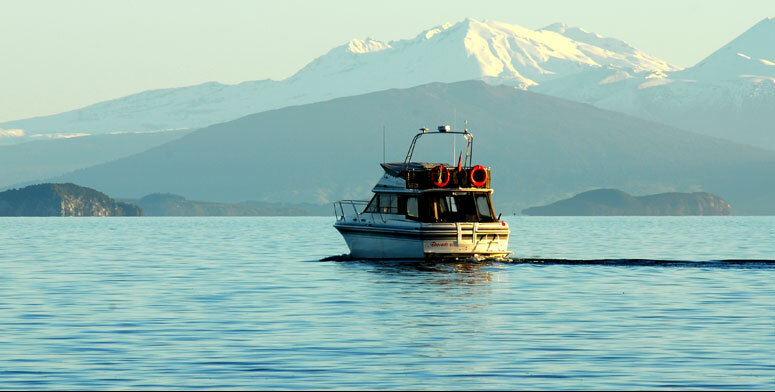 Lake Taupo (with her backdrop of volcanoes and mountains) provides endless beauty, adventure, relaxation and sightseeing. Lake Taupo has it all and more! If bringing your own boat on holiday, you’ll be pleased to know that a boat launching ramp is located just 2 minutes drive from Acacia Cliffs Lodge (plus other boat ramps less than 10 minutes drive from our lodge also).